Ichneumonidae (Hymenoptera) of Warsaw and Mazovia. Proctotrupoidea (Hymenoptera) of Warsaw and Mazovia. Chrisidae (Hymenoptera) of Warsaw and Mazovia. Ants (Hymenoptera, Formicoidea) of Warsaw and Mazovia. 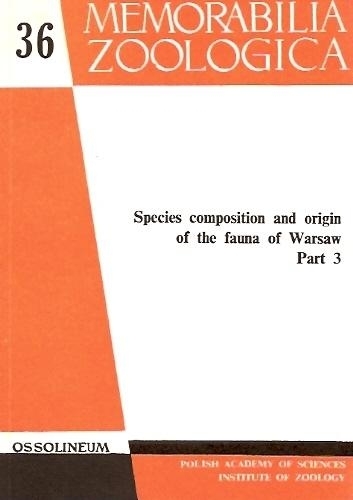 Wasps (Hymenoptera, Vespidae) of Warsaw and Mazovia. Sphecidae (Hymenoptera) of Warsaw and Mazovia. Apoidea (Hymenoptera) of Warsaw and Mazovia. Auchenorrhyncha (Hymenoptera) of Warsaw and Mazovia. Neuroptera and Mecoptera of Warsaw and Mazovia. Noctuids (Lepidoptera, Noctuidae) of Warsaw and Mazovia. Mosquitoes (Diptera, Culicidae) of Warsaw and Mazovia. Springtails (Collembola) of Warsaw and Mazovia. Soil mites (Acari) of Warsaw and Mazovia. Millipedes (Diplopoda) of Warsaw and Mazovia.